Become a better fisherman with our "How To" series of fly fishing videos. We will educate and entertain you with our professionally produced videos by top guides. are what we do at FLY FISH TV, specifically fly fishing instructional videos. 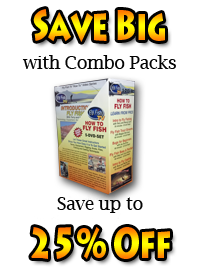 Our goal is to make YOU a more successful fisherman, whether you’re just getting started out and looking for your first “how to fly fish video” or if you are a seasoned angler looking for a specialty midge fishing video we have you covered. What you won’t find here are pretty pictures videos with hundreds of quick cuts of other people catching big fish set to music. There is plenty of that out there already and while there isn’t anything wrong with it, it’s not what we do. All of our productions are focused on fly fishing and tying instruction, not adventure, and are hosted by the top professionals in the sport. They are experienced fly fishing instructors who have distinguished themselves as guides, lecturers, or authors in some aspect of fly fishing. Our top selling hosts, like Kelly Galloup, Davy Wotton, and Denny Rickards, are considered the premier practitioners of their fly fishing specialties. You will find we have a variety of titles on the basics of fly fishing that cover everything from terminology, equipment, rigging, knots, fly selection, entomology, starting to fly fish, beginner fly casting. We also have some great “getting started” videos on fly fishing trout streams, lakes, and fly fishing for bass and pan fish. If you want to start tying flies we have you covered there as well. Our “Fly Tying Fundamentals” is one of the best basic fly tying videos ever on learning to tie flies. Our intermediate and advanced skill instructional videos can really take your fly angling up to the next level. Our top selling host, Kelly Galloup, can show you how to fish and tie streamers that can consistently help you catch the biggest trout in your home waters. He is also is an exceptional hand at nymph fishing for trout, and has videos available on nymph rigging, nymph fishing, reading water, and high stick nymphing techniques. Davy Wotton is our wet fly fishing and wet fly tying expert and is considered one of the most knowledgeable on the subject in the world. Recently we produced both midge fly fishing and midge fly tying videos with Davy and they have received great reviews. We also have fly fishing destination videos on a few of the top trout fishing rivers in the United States. These are not fishing adventures but detailed profiles of trout fisheries that give you all the maps, techniques, fly patterns, and information you need if you plan on giving them a try. Kelly Galloup hosts the profile of trout fishing the Madison River where he lives and works. Davy Wotton hosts trout fishing on the White River in Arkansas where he guides. And renowned Idaho trout angler Mike Lawson hosts fly fishing the Henry’s Fork River and the South Fork of the Snake River. Our selection of fly tying videos covers it all, from classic fly tying patterns for trout streams to the latest articulated streamer flies. If you are new to fly tying and you want to learn how to tie flies, we recommend you start out with Fly Tying Fundamentals. Once you have the basics covered we have a wide variety of specialized titles covering everything: stillwater trout fly patterns, streamer fly patterns, articulated streamer fly patterns, wet fly patterns, midge fly patterns & more! Why buy a fly fishing video from FFTV? It’s a simple answer really…what’s your time worth? There is some good content out there, but it’s an Easter Egg hunt. You can spend a whole day watching nymph fishing videos, and even if you are able to sort through all the garbage and misinformation you still probably won’t have all the pieces of the puzzle put together like Kelly Galloup does in Nymphing by the Numbers. Our professionally produced videos boil topics down to their essence and build them back up from there. Our videos aren’t sponsored by a specific equipment manufacturer, so we aren’t producing infomercials and selling them as educational videos. We take the top professionals in the industry and squeeze the gritty details out of them. We delve deep into a topic and cover all the angles. Fly fishing is a sport of details; little things can make all the difference in the world. We won’t show you one technique…we’ll show you five and then we’ll tell you when to use them. We hope you'll give some of our exceptional instructional fly fishing videos a try. There are preview clips available of every production to give you a taste of what we have to offer. Many of our titles are available to watch instantly via streaming video. Most of our customers report back happy to have added one of our titles to their fly fishing library, and that they find themselves going back to them repeatedly as a reference. That’s as good a complement as any for us!